The defence of the earth, the ecosystem and biodiversity is one of the most important topics on the agenda of the social movements in Latin America today and that is precisely what is at stake in the United Nations Summit on Sustainable Development Rio +20, which will take place in June 2012 in Rio de Janeiro. 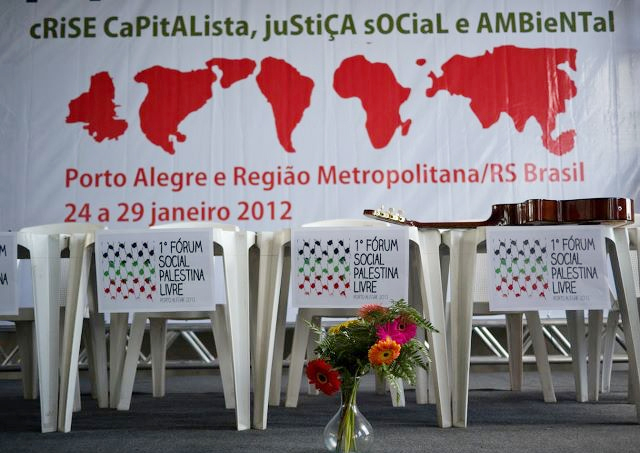 The thematic Social Forum ’capitalist crises, environmental and social justice’, which concluded on Sunday 29 January in Porto Alegre (Brazil), served to establish the basis for mobilisation for this key date. The offensive of the system, via green capitalism, intensifies in its determination to privatize every aspect of life and nature. And in an economic crisis like the present, one of the strategies of capital to recover its falling rate of profit is based on commercializing the ecosystem. They present new technologies (nanotechnology, biofuels, geoengineering, genetically modified foods) as the alternative to the climate crisis when it will only make the social and ecological crises we face more acute. All indications are that the Rio +20 Earth Summit will to serve to clear the way for multinational to justify their practice of appropriation of natural resources. Hence the importance of the People’s summit of Rio +20, to be held days before the official event, organized by a large range of social movements which will present alternative programme and rob and roadmap. In Europe and in the United States the resistance of the indignados focuses mobilisations against cuts to the welfare state, privatizations, banking and the payment of illegitimate debt. Paradoxically these are topics that were central to the movements in Latin America in the decades of the 80s, 90s and 2000s..Putting the question of the ecological crisis and the green economy on the agenda of these new social movements, the indignados and the occupy movements was another issue raised repeatedly at this thematic Social Forum. The need to link the fight for social justice with the fight for ecological justice was a major focus..
One final concern at this forum, which had been latent at previous events which is made more urgent by recent events is to rethink the World Social Forum process in the context of opening of a new cycle of social protests. The social movements that have emerged in the Arab world and North Africa, Europe and the United States put forward an agenda for action outside the social forum process which was an important instrument in the previous period. Despite the success of the day of global actions on O-15 (15/10/2011), international co-ordination was rather weak. Ten years ago in contrast, the social forums (and particularly the World Social Forum and the European Social Forum) were one of the main benchmarks of the dynamic global justice and antiwar movements, and acted as the driving force to develop a programme and a series of actions to fight against neo-liberal globalization and war. This is now in the past. And now we need to see what new tools we can create to coordinate this new tide of outrage. What is certain though is that in this journey to develop these new frameworks and processes, the experience of the World Social Forum, the global justice campaigns and the initiatives of the previous period have not been in vain but the opposite.